Acme Blinds are leading blinds manufacturers of parasols, canopies, roller blinds, blackout blinds roman blinds amongst many other types of blinds. Acme Blinds in New Ross, Wexford offers a free measuring and fitting service to all areas of New Ross and the county's surrounding regions. Contact the showroom today and pop in to view our extensive range. 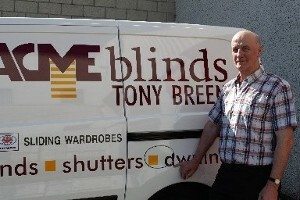 With over 60 years experience supplying made-to-measure blinds in Wexford contact us today for a quotation.